Learn how to load the cartridges here. Temperature – Use when Temperature is between 45 deg. F. and 100 deg. F.
Please note: unpack immediately upon arrival and check for any issues. You may note some slight weeping of the cartridge- this is normal as temperature changes during shipping can affect the foam. If you do not plan to use product immediately, it should be stored in a climate controlled environment in an upright position to maintain foam integrity. An open/partially used canister can be stored for up to one year, PROVIDED you retract each cartridge plunger SLOWLY each side, slightly and evenly. I use a hammer handle to create a “head space of air’ in each side of the cartridge. Intact carefully set cartridges can be stored for up to 3 years in a cool dry place. Once you are ready to use the product, gently mix the canisters by rotating up and down or over and over slowly for a few minutes. A large cardboard box to put expended paper towels, cartridges and ejected foam into. Several rolls of paper towels. Acetone (for removal of wet product preventing stains). Masking tape (or coconut or tanning oil spray – at your own risk of slip and fall!). New non-skid paint is recommended. Crayola “air dry molding clay” or any quick dry clay for replicating deck texture (if desired). Rubber Plugs for temporary use while injecting foam in upside down applications, ( black ¼” available on Amazon). Spray oil for masking (Caution! This is a slip hazard – watch your step or don’t do it). Personal Protective Equipment (PPE) – Protective goggles and nitrile gloves. Set up cleaning supplies – Place them nearby so they are handy and ready when needed. Have an assistant help, following behind you cleaning. WARNING! Personal Protection – Wear the included safety goggles. Failure to do so may result in injury or blindness. WARNING! Materials Safety – Read and follow all MSDS precautions, especially on the Acetone, and never mix chemicals. Always use in well ventilated areas or outside. Soft spot location & marking – Walk your deck with a pencil marking your soft spots and your stringer locations (floor joists). Feel the outside edge of the soft spot with an X in the center of it, lay out a hole pattern 8″ – 12″ or more and come 3″ off the hard edge of core. You can drill as many as you like, it’s just more to plug later. If you have a soft spot in a stringer beneath the deck (floor support), drill through the floor using a 3/8″drill and into the stringer and inject it. The fiberglass the stringer is wrapped in will contain the product. You can fill delamination in thick layered fiberglass by skim injection and easily fill cavities left by drained water. Use this method only if you have thick upper glass like on many sailboats, 3/16 – 5/16″. Drilling – Before opening a cartridge of Injectadeck you must first drill your holes in the center of the soft spot exposing the cavity or airspace to fill. Inspect your drill bit “core sample” to look at what’s inside the deck. Then, come 3” away from the hard edges and drill a few more holes in a 8-12” pattern. This is important so you can do the injection in one continuous process to prevent the gun’s mixing tip from clogging. Find the low point in the fiberglass sandwich from the underside and drill a drain hole or two. This is also your safety vent – too much deck pressure could blow out product along with the gases. If you are stepping down a bulge wait till the foam has reacted and is moving slowly before applying deck pressure. WARNING! – Oil spray masking is dangerous to walk or stand on and may result in slips and falls. Use it at your own risk. Use sparingly and crawl backward off your work. Use masking tape instead if you prefer not to take the risks associated with oil spray masking. Make sure your boat deck or gunwale is level. You can mask by spraying oil around, not IN, the drilled holes. drill holes 8″ – 12″ apart. THIS PRODUCT IS NOT MEANT FOR COIN SIZED SOFT SPOTS. It’s designed for big areas, the bigger the better. Injectadeck does not “SOAK IN” to anything, it fills the airspace. If your top glass is thin, shoot it under the wood or core. If you have 3/16″ thick or greater top fiberglass thickness, you can skim under the top layer of fiberglass with very little bulging if you pump in excess since it is easy enough to force outward or downward. Cleanup is significant, bring a helper with gloves on. Be sure to DRILL ALL OF YOUR HOLES FIRST. Our NEW formula requires you drain all the excess water you can. 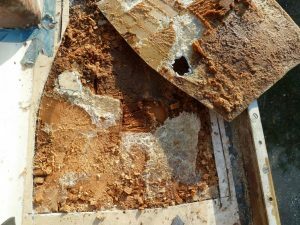 Many seemingly dry core areas are caused by a crack in the lower fiberglass layer letting the water out. This Foam uses water in its catalytic action, there is enough water in the cartridge but it wants more. Dry the deck surface and mask or spray off the entire area around your 3/16 to 1/4″ holes. Injecting – Inject your deck in 3 rounds, using your 3 tips and you won’t miss a soft spot. When loading into the gun MAKE SURE the gun’s piston discs are seated properly in the cartridge end caps. If you catch an edge it can flip the plunger and leak the product out of the rear of the cartridge. Be sure to use the black restrictor and squeeze SLOWLY. Use the trigger release very often! SQUEEZE SLOW one soft click at a time thru the restrictor. Use a blade to cut your tip to fit exact in the drilled hole. Have a gloved assistant dam up the ejected foam with paper towels for you. Before Loading the cartridge, rotate it over and over mixing the chemicals in each tube for best results! Load the cartridge into the gun, remove the blue cap, and the white plastic. Install the black restrictor over the cartridge holes then Install the mixing tip, first looking inside to align its wall into an X with the restrictor. Just pull down tight, then collar it. Before injecting, pump a little out onto cardboard until it is mixing evenly. Once you squeeze the gun and product begins flowing through the tip, use just what you need. CAUTION! – If set aside, the gun’s tip will clog in approx. 2 or 3 minutes. If you wish to restart the injection process, first change the tip. Squeezing against a clogged tip, stuck tube, or a full drill hole may result in the gun bending or breaking. This could also cause the cartridge plunger to flip over and make a big mess. In addition, a partially clogged tip could deliver an 80/20 soft foam mix, not a solid 50/50 mix! Estimate the void size – remember there is a 6X expansion dry, and 8X expansion moist, so just trust the expansion. Small areas just need a half squeeze of an ounce or two. Inject the product into the deck in two stages, squeeze the product in slowly, one click at a time, releasing a few ounces at a time while hitting the trigger release often (the gun’s release lever takes the pressure off the cartridge). Always press the trigger release before removing the tip from the hole. Each trigger click is about 3 cups of soon-to be hard foam still flowing. If you pump a few clicks in an area of say 5 holes? Hit the release often. If Injectadeck foam tries to come out keep it inside the deck until expansion/reaction begins then remove the plug or your finger. Do not FORCE the product into the hole. Sometimes a high-pressure squeeze will separate the lower sheet and spread across it. This can be beneficial as it runs along the lower sheet where the voids start. CAUTION! – PRESSURE PUMPING A CLOGGED TIP CAN BEND THE GUN or flip a plunger leaking the product. CAUTION! – Stopping (over 60 secs) could dry foam in the mixing tip and also cause a poor mix. Move from hole to hole – You must work rapidly to prevent the foam from curing in the tip. For less mess and waste, press the trigger release and as you pull the tip from the hole, It usually looks like nothing happened, you can still see the void! Move on and give all the voids a shot and skip the places where you hit solid anything with no void. A few minutes later, go around to all your holes and remove the puffs of foam and clean using Acetone and a rag with a respirator sold where you received the acetone usually.. Your large-area masking job will allow you to work quickly and cleanly. In an 8″-12” pattern, inject a gun-click of foam per hole then release trigger, plug mix tip with finger, and move to the next hole. Repeat until all holes are filled. Small spots may need a faster trigger release. WAIT a few min. before applying gentle pressure to spread the product and prevent bulging (a good time to clean up any ejected water). You can shape your floor in this manner and you may wish to get some help since more feet make it easier over larger areas. As the foam hardens in 20 to 30 minutes, look for more soft spots. Should you feel additional soft spots, drill a hole(s) change mixing tips, and repeat the injections, filling the soft spots anywhere you feel one. There is no limit on the number of holes you can drill. CAUTION! – Keep additional drill holes 4” away from any other holes to prevent cracking. 10-inch spacing is the norm. Clean up – It helps to have a good wide oil spray masking job and an assistant to follow behind the “injector” wiping up the excess foam with acetone and a rag (wearing Protective Equipment). During the 20-30 minute cure you will usually see small puffs of foam exiting the injection holes. Use Acetone to clean deck stains before the puffs harden. Use lots of tape, paper towels and I use a cardboard box to stow ejected product with paper towels. We tear off towels to “Dam Up” the foam, if we inject too much. CAUTION! – You must clean the excess off surfaces immediately, before it has a chance to cure. Injectadeck stains yellow so be prepared to roll new nonskid paint OR BE well masked to prevent stains. Final drill hole filling & touch up – There are several ways of filling your injection site. 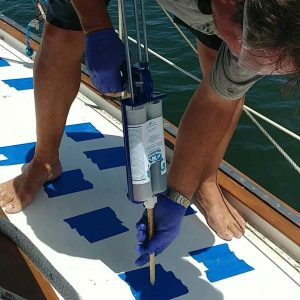 The best way is to use Marine RX white epoxy, A.K.A. MarineTEX. 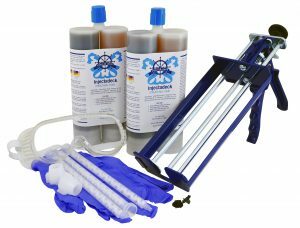 Fiberglass resin is also good – resin you can sand or Dremel it, and we like to roll new topside paint on the larger jobs. Be prepared to re-apply non-skid to your deck in 30 min with a 3″ roller. We typically roll the deck with new non-skid. Texture matching – You can copy your non-skid pattern using tooling clay or Crayola “air dry molding clay” (Approx. $8) if you like. Once you’ve taken an impression of the texture with the clay let it dry and you now have your texturing tool. This allows you to recreate the non-skid pattern in semi cured epoxy and camouflage your drilled holes, just touch up non-skid paint to match. Storing unused portion – As soon as your holes are all injected, press the trigger release, unscrew the collar and tip. Use a hammer handle and retract each plunger, even and gentle to create a headspace of air in the cartridge halves. Take the white cartridge plug and the black restrictor plate you removed and clean well with Acetone. Replace these in their places under the blue cap of the cartridge. Injectadeck cannot be mixed and installed without the special mixing tip, so order extras. Store unused portions standing up in a cool environment for up to a year. CAUTION! – If you force the product through a clogged tip, or full drill hole, it will force the product to bypass the plunger and will then harden into a “stuck tube” which cannot be re-used. This may also bend/break the gun. Drill a relief hole in the low point of every fiberglass sandwich core structure for a water displacement drain and gas vent. This will allow the foam to displace moisture and fill the cavity to best effect. The ideal situation is that most of the liquid displaces as the foam expands and the foam catalyzes with the remaining moisture. Once you have started injecting you will not want to set the gun aside until finished. Use what you need in one application, not more. Squeeze the trigger slowly and firmly a click at a time, watch the product flow, this is not caulk, this is liquid. Press that silver tab on the gun before you lift the gun from the floor. Later, after 10 minutes or more, be prepared to step on the area and shape the foam, expansion ceases in about 5 minutes, excess product will come out and any bulge transfers to the underside. For perfectly level floors lay down sections of plywood and add weight with 3″ access holes to the drill holes in your deck. If you see a bulge after 10 minutes step on it applying pressure very gently at first, testing it, not to force product out. Too hard already? You may bounce your weight up and down on it, before it hardens all the way. For each void, shoot in a few ounces and wait, trust the expansion. In the photo below it shows the holes about 8″ – 12″ or more, skipping over solid areas with no void. WARNING! – Injectadeck is NOT recommend for use on Transoms. While people seem to like it for that, transoms are a critical structural component and Injectadeck does not have the same structural load bearing properties as your fiberglass transom. WARNING! – Be careful with this and all chemical products – misuse can result in injury to people, pets, finishes, etc. This is a professional product, purchase and use at your own risk. Questions? TEXT the Injectadeck Tech Line at: +1-727-768-7509 We’re here to help! !